This Guide explains how to use the Analytica Optimizer. It provides a Quick Start Tutorial and an introduction to the basic concepts of optimization, including linear, quadratic, and nonlinear programming (NLP), as well as special topics in NLP. However, it is not a complete textbook on optimization. For more challenging applications, you might find it useful to consult one of the many good textbooks on optimization. You will find it easier if you first learn the essentials of Analytica before learning the Analytica Optimizer described here. Start with the Analytica Tutorial to learn the basics of interacting with Analytica and its modeling language, especially Working with Arrays. It's important to have a good understanding of Intelligent Arrays to make good use of the Optimizer. We recommend you to start with the Quick Start, an introductory tutorial that takes you through the key steps to create a simple optimization, including Structured Optimization, and Optimizing with Arrays. The section on Optimization Characteristics explains the general principles of optimization and the types of optimization, including Linear Programming (LP), Quadratic Programming (QP), and Non-Linear Programming (NLP). We also recommend reading Optimizing with Arrays to understand optimization with parametric analysis. Key Concepts: The Airline NLP Example explains dynamic and stochastic optimization with models that are dynamic (changing over time) and/or uncertain using Monte Carlo. You can read the pages in this guide in any order. But, if you want to go through them sequentially, you can use the links to the previous and next pages at the bottom of each page. 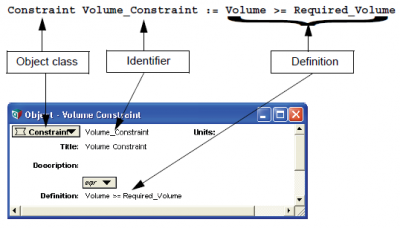 In this example, a Constraint with identifier Volume_Constraint has the Definition Volume >= Required Volume.